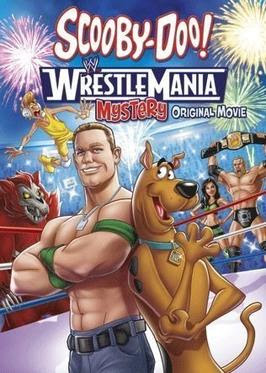 So last night I ran to Twitter and laid out the plot to a sequel to Scooby Doo Wrestlemania Mystery movie. Someone had mentioned the movie early that morning and then I couldn't get my idea for a sequel out of my head. So during a night of everyone being political I carpet bombed Twitter with my 12 part story. It's hard to get a lot of information out there when you're worried about character limits. So instead of letting all that brain power go to waste, I'm reposting it here where it is easier to read. Of course this is all made up in my head, there is no chance in hell of this story becoming real. The film opens to a shot of Dean Ambrose and Seth Rollins wrestling in WWE city. Fog rolls in, there is a ghostly flash, and the sounds of a fight. When the fog clears the ring is empty. Other wrestlers look around shocked. Then there is a quick cut to the theme song. After the theme we cut to the Scooby gang showing up to WWE City. After all their help the last time, John Cena called them to help look into the missing wrestlers. When the gang walk into the training center they see Miz practicing with Kalisto. Suddenly a ghostly Roddy Piper appears. He taunts the wrestlers before smoke fills arena. When the smoke clears the Miz is gone. In the confusion the lights go out and the Wyatt family arrives by lantern light. Bray cuts a promo how he is the true evil and how his family will be taking over the WWE. Luke Harper makes faces at Shaggy and Scooby, scaring them while Bray talks. Meanwhile Eric Rowan wordlessly stares at Velma. When the Wyatts leave Cena, Kalisto, and Paige offer to help the gang investigate the ghosts and the missing wrestlers. Everyone was creeped out by Wyatt's and Shaggy and Scooby are sure that they are behind the missing wrestlers. As the team look for clues the pattern repeats itself. Ghosts of past wrestlers show up, taunt the living, and then disappear with current wrestlers. 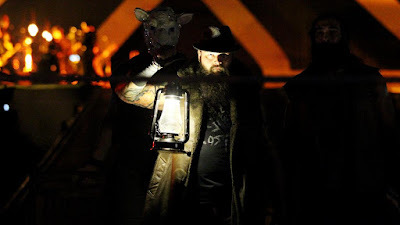 Then the Wyatt family show up saying how they are going to take over WWE City. Everyone is getting worried and the big WWE Championship match is coming up, because someone will have to face Bray. When Paige is kidnapped the Hex Girls quickly arrive to help. Because of course the Hex Girls are friends with Paige. The night of the big match arrives. It will be John Cena versus Bray Wyatt and the winner will get the championship belt. But before the match Cena is attacked by the ghost of Andre the Giant! Before the gang can save him he disappears. The WWE is terrified the Wyatts are going to capture the belt and only midcard wrestlers are left to challenge him. 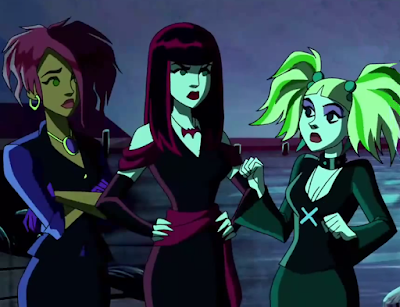 Before any of the other wrestlers can step up, the Hex Girls volunteer a plan. Using their magically infused rock and roll they summon the Undertaker. The Undertaker begins to fight Bray Wyatt when the ghost of the Ultimate Warrior arrives. But the Scooby gang have an elaborate trap to catch the ghost this time. 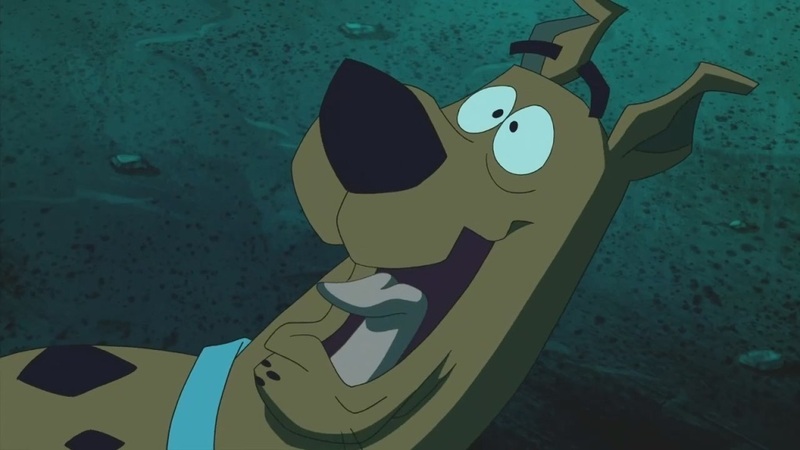 Except Luke Harper scares Scooby and the trap is disrupted letting the ghost go free. The rest of the Wyatt Family tries to interfere in the match but the Hex Girls fend them off. Scooby and the ghost end up crashing down onto Bray Wyatt letting the Undertaker pin him one, two, and three. The ghost is quickly unmasked to find Damien Sandow! Banished to the midcard, Sandow thought he could get a title shot by kidnapping all of the higher ranked Superstars. He used his acting ability to impersonate all of the past wrestlers. He would have gotten away with it too if it wasn't for those meddling kids! All of the kidnapped wrestlers were stashed under the ring, because that’s the kind of silliness that would fly in a movie like this. The newly crowned champion Undertaker scares Scooby as everyone else watches and laughs. After staring at Velma all movie Eric Rowan shows up and gives her a flower, obviously geniuses can recognize each other. Cut to credits and the theme song.